The carbon laser peel procedure is the latest laser peeling treatment technique that uses a carbon lotion as a photo-enhancer in order to achieve multiple therapeutico-cosmetic effects on the skin being treated. Clear the pores from sebum. Shrink the sebaceous oil-producing glands, thus making the skin less oily (oil control) and decreasing the development of new acne. 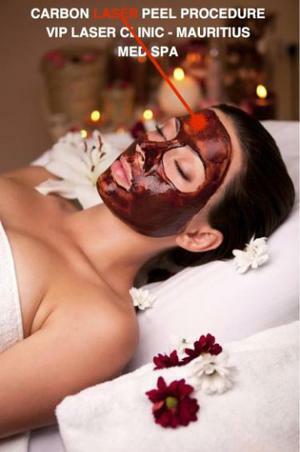 Remove dead skin cells from the superficial . Stimulate collagen, improving skin tone. Kill and remove acne-causing bacteria, thus helping to treat moderate to severe acne. Prevent future break-outs of acne. Decreasing and eliminating hyperpigmentations (melasmas, cafe-au-lait spots, lentigines, freckles, etc.). Cause skin firming or tightening and helps reduce fine lines and wrinkles. Help the skin acquire significant luster. The Carbon Laser Peel procedure normally takes around 1 hour 30 min, including cleansing and preparation of the skin and application of a nano-mask after the laser treatment. No anaesthesia is used for carrying out the carbon laser peel procedure. There is no down time after this procedure. One can return to one's work or other activities after the procedure. The usual precaution to be taken is to avoid direct sun and heat exposures. After the carbon laser peel procedure, a gentle moisturizer, an anti-oxidant and a sunscreen of spf 30 are applied in the treated skin zone. The recommended aesthetic products (for acne, hyperpigmentations, wrinkles etc.) can be used safely the next morning. Several sessions of the carbon laser peel procedure is recommended for active acne with an interval of 2 weeks, then maintenance treatment 2-3 times a year. The Carbon Laser Peel is effective on all forms of acne in adults as well as teens. 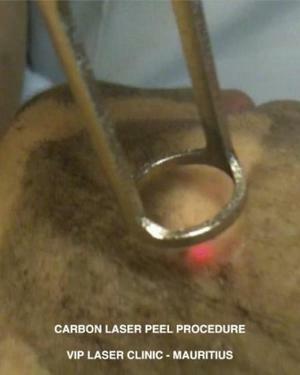 VIP Laser Clinic Med Spa is the only medical practice in Mauritius offering the original carbon laser peel procedure.